Konrad Hermann Joseph Adenauer (German: [ˈkɔnʁaːt ˈʔaːdənaʊ̯ɐ] ( listen); 5 January 1876 – 19 April 1967) was a German statesman who served as the first Chancellor of the Federal Republic of Germany (West Germany) from 1949 to 1963. He switched focus from denazification to recovery and led his country from the ruins of World War II to a productive and prosperous nation that forged close relations with France, the United Kingdom and the United States. During his years in power, West Germany achieved democracy, stability, international respect and economic prosperity ("Wirtschaftswunder", German for "economic miracle"). He was the first leader of the Christian Democratic Union (CDU), a Christian Democratic party that under his leadership became one of the most influential parties in the country. Adenauer, who was Chancellor until age 87, was dubbed "Der Alte" ("the elder"). British politician and historian Roy Jenkins says he was "the oldest statesman ever to function in elected office." He belied his age by his intense work habits and his uncanny political instinct. He displayed a strong dedication to a broad vision of market-based liberal democracy and anti-communism. A shrewd politician, Adenauer was deeply committed to a Western-oriented foreign policy and restoring the position of West Germany on the world stage. He worked to restore the West German economy from the destruction of World War II to a central position in Europe, presiding over the German Economic Miracle. He was a driving force behind West Germany becoming the first German state to re-establish a national military (the Bundeswehr) in 1955. He came to terms with France, which made possible the economic unification of Western Europe. Adenauer opposed rival East Germany and made his nation a member of NATO and a firm ally of the United States. A devout Roman Catholic, he had been a leading Centre Party politician in the Weimar Republic, serving as Mayor of Cologne (1917–1933) and as president of the Prussian State Council (1922–1933). In mid-October 1923, the Chancellor Gustav Stresemann announced that Berlin would cease all financial payments to the Rhineland and that the new Rentenmark, which had replaced the now worthless Mark would not circulate in the Rhineland. To save the Rhineland economy, Adenauer opened talks with the French High Commissioner Paul Tirard in late October 1923 for a Rhenish republic in a sort of economic union with France which would achieve Franco-German reconciliation, which Adenauer called a "grand design". At the same time, Adenauer clung to the hope that the Rentenmark might still circulate in the Rhineland. Adenauer's plans came to nought when Stresemann, who was resolutely opposed to Adenauer's "grand design", which he viewed as borderline treason, was able to negotiate an end to the crisis on his own. Adenauer was imprisoned for two days after the Night of the Long Knives on 30 June 1934, however, on 10 August 1934, maneuvering for his pension, he wrote a ten-page letter to Hermann Göring (the Prussian interior minister). He stated that as Mayor he had violated Prussian laws in order to allow NSDAP events in public buildings and Nazi flags to be flown from city flagpoles and that in 1932 he had declared publicly that the Nazis should join the Reich government in a leading role. In 1986 the magazine Der Spiegel reported that at the end of 1932, Adenauer had indeed demanded a joint government by his Zentrum party and the Nazis for Prussia. After being dismissed, Adenauer devoted himself to building a new political party, the Christian Democratic Union (CDU), which he hoped would embrace both Protestants and Roman Catholics in a single party, and thereby achieve his long-standing goal of bringing the Zentrum "out of the tower". According to Adenauer, a Catholic-only party would lead to German politics being dominated by anti-democratic parties yet again. In January 1946, Adenauer initiated a political meeting of the future CDU in the British zone in his role as doyen (the oldest man in attendance, Alterspräsident) and was informally confirmed as its leader. Adenauer had become a leader almost by default. During the Weimar Republic, Adenauer had often been considered a future Chancellor and after 1945, his claims for leadership were even stronger. The other surviving Zentrum leaders were considered unsuitable for the tasks that lay ahead. Reflecting his background as a Catholic Rhinelander who had long chafed under Prussian rule, Adenauer believed that Prussianism was the root cause of National Socialism, and that only by driving out Prussianism could Germany become a democracy. In a December 1946 letter, Adenauer wrote that the Prussian state in the early 19th century had become an "almost God-like entity" that valued state power over the rights of individuals. Adenauer's dislike of Prussia even led him to oppose Berlin as a future capital. Adenauer's Sonderweg view of German history, with National Socialism as a natural outgrowth out of Prussianism, sharply contrasted with the views of the Social Democratic leader Kurt Schumacher, who saw National Socialism as a natural outgrowth of capitalism. These two radically differing views of recent German history led Adenauer and Schumacher in turn to recommend very different solutions for a better future. For Schumacher, to banish National Socialism meant replacing the capitalist system with a Marxist socialist system, whereas, for Adenauer, banishing National Socialism meant purging Prussianism. Adenauer viewed the most important battle in the postwar world as between the forces of Christianity and Marxism, especially Communism. In Germany during this period, the term Marxism described both the Communists and the Social Democrats as the latter were officially a Marxist party until the Bad Godesberg conference of 1959 when the SPD repudiated its commitment to achieving a Marxist society. The same anti-Marxist viewpoints led Adenauer to denounce the Social Democrats as the heirs to Prussianism and National Socialism. Adenauer's ideology was at odds with many in the CDU, who wished to unite socialism and Christianity. Adenauer worked diligently at building up contacts and support in the CDU over the following years, and he sought with varying success to impose his particular ideology on the party. In 1950, a major controversy broke out when it emerged that Adenauer's State Secretary Hans Globke had played a major role in drafting anti-semitic laws in Nazi Germany. Adenauer kept Globke on as State Secretary as part of his strategy of integration. Starting in August 1950, Adenauer began to pressure the Western Allies to free all of the war criminals in their custody, especially those from the Wehrmacht, whose continued imprisonment he claimed made West German rearmament impossible. Adenauer had been opposed to the Nuremberg Trials in 1945–46, and after becoming Chancellor, he demanded the release of the so-called "Spandau Seven," as the seven war criminals convicted at Nuremberg and imprisoned at Spandau Prison were known. When a rebellion in East Germany was harshly suppressed by the Red Army in June 1953, Adenauer took political advantage of the situation and was handily re-elected to a second term as Chancellor. The CDU/CSU came up one seat short of an outright majority. Adenauer could thus have governed in a coalition with only one other party, but retained/gained the support of nearly all of the parties in the Bundestag that were to the right of the SPD. For all of his efforts as West Germany's leader, Adenauer was named Time magazine's Man of the Year in 1953. In 1954, he received the Karlspreis (English: Charlemagne Award), an award by the German city of Aachen to people who contributed to the European idea, European cooperation and European peace. In November 1954, Adenauer's lobbying efforts on behalf of the "Spandau Seven" finally bore fruit with the release of Konstantin von Neurath. Adenauer congratulated Neurath on his release. President Heuss went even further, telling Neurath of his "martyrdom" at Nuremberg, and strongly implied that Neurath had been framed by the Allies. The statements welcoming Neurath's release by Heuss and Adenauer sparked controversy all over the world. At the same time, Adenauer's efforts to win freedom for Admiral Karl Dönitz ran into staunch opposition from the British Permanent Secretary at the Foreign Office, Ivone Kirkpatrick, who argued Dönitz would be an active danger to German democracy. Adenauer then traded with Kirkpatrick no early release for Admiral Dönitz with an early release for Admiral Erich Raeder on medical grounds. Soviet leaders greeting Adenauer in 1955. Adenauer managed to remain in office for almost another year, but the scandal increased the pressure already on him to fulfill his promise to resign before the end of the term. 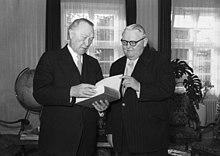 Adenauer was not on good terms in his last years of power with his economics minister Ludwig Erhard and tried to block him from the chancellorship. 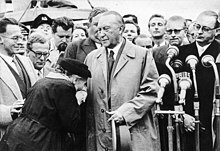 In January 1963, Adenauer privately supported General Charles de Gaulle's veto of Britain's attempt to join the European Economic Community, and was only prevented from saying so openly by the need to preserve unity in his cabinet as most of his ministers led by Ludwig Erhard supported Britain's application. A Francophile, Adenauer saw a Franco-German partnership as the key for European peace and prosperity and shared de Gaulle's view that Britain would be a disputative force in the EEC. Adenauer failed in his efforts to block Erhard as his successor, and in October 1963 he turned the office over to Erhard. He remained chairman of the CDU until his resignation in December 1966. Adenauer ensured a truly free and democratic society and laid the groundwork for Germany to reenter the community of nations and to evolve as a dependable member of the Western world. It can be argued that because of Adenauer's policies, a later reunification of both German states was possible; and unified Germany has remained a solid partner in the European Union and NATO. The British historian Frederick Taylor argued that Federal Republic under Adenauer retained many of the characteristics of the authoritarian "deep state" that existed under the Weimar Republic, and that in many ways the Adenauer era was a transition period in values and viewpoints from the authoritarianism that characterized Germany in the first half of the 20th century to the more democratic values that characterized the western half Germany in the second half of the 20th century. What's the good word on Konrad Adenauer?